It's that time of year again--artichoke time! 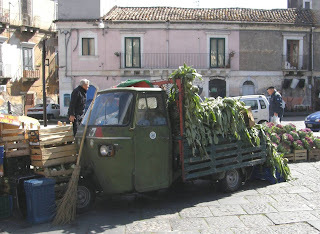 All over the streets and in the markets, you'll see these little 3-wheeled trucks loaded down with artichokes, which are sold in bundles of like . . . twenty-four! You can't just buy one, or even ten. And they are cheap, something like three or five euros for that many ($4.50-$7.50). 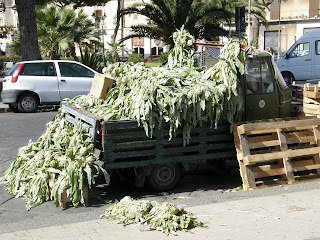 These green, hairy artichoke monsters can be seen all over Sicily. As if there weren't enough turmoil in Nicolosi this morning with the Catania-Etna auto race snarling traffic and extra people jamming our usually quiet bar, a pretty big earthquake rocked our little town. Several of us were sitting out on the patio grousing about the blocked roads, no parking, the crowd of race fans and drivers at the bar, and especially about the noise of the dozens of race cars revving their engines all around us, when suddenly, an even louder noise, like thunder, occurred and the whole building seemed to drop violently and then lift and then shake for several seconds, followed soon after by a very strong aftershock! The barmen yelled at everyone to leave the building, so we grabbed our belongings and our tall glasses of Baileys that we'd just gotten and headed out to the sidewalk. Car alarms started going off and all the race cars shut off as people poured into the streets. (See photo above.) Cell phones were immediately unusable as all the circuits jammed. Despite shaking knees and pounding hearts, we toasted "To life!" and waited for a few minutes before taking back our tables on the patio. I don't think I've felt an earthquake this big here, although I have felt many tremors and even been waked up at night once. La Sicilia, Sicily's own newspaper and website, reported a "seismic shock of magnitude 3.2, was felt at 9.47 this morning" in Nicolosi. "The seismic shock recorded this morning on Etna was clearly felt by the population and in particular Nicolosi, where many people have thrown in the streets and squares." (That's a Google translation, so people were not really "thrown" into the streets, but went out for safety.) My friends Matt and Christine were still at home when it hit, and all of their neighbors were out in the street, even in their pajamas. Apparently, that's the thing they do when there's an earthquake--get OUT of the building. Matt also said two of his cats were howling like crazy right before the quake. They say animals somehow know. According to La Sicilia, no one was reported injured, although three churches in town were immediately evacuated during Mass (and one was celebrating First Communion), and "The greatest damage was recorded in the Cathedral Church, where pieces have fallen cornices external plaster and have damaged the interior plaster and two aisles." In fact, there were thirty reports of damage to houses and businesses in the town. Luckily, the civil defense was already on the spot due to the big auto race, which went on as planned. The president of the region was on hand (for the race) and gave it his approval. It's been quiet ever since this morning, but they also say that an earthquake happens before Etna erupts, so I'm keeping an eye on it. Stay tuned. 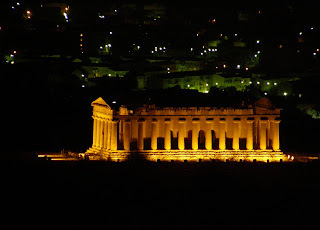 Over spring break, I again was able to visit Agrigento and the Greek temples. They have finished all work on them at the moment, and they look great! 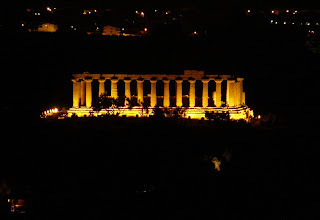 My new Olympus SP-55OUZ did a spectacular job with the temples of Concord (above) and Hera (below) at night from my hotel room at the Colleverde Park Hotel. I used no special settings at all, just set the camera on a little table-top tripod on the windowsill! I highly recommend this hotel, which is small but elegant and perfectly located for a view of the temples at night. They are moderately priced and also have a very nice restaurant as well as great service. "Should you only have one day to spend in Sicily and you ask me 'what is there to see?' I would reply 'Taormina' without any hesitation. It is only a landscape but one in which you can find everything that seems to have been created to seduce the eyes, the mind and the imagination." --Guy de Maupassant, 1885, from "Towards the Golden Skies," diary of a journey.